Tablets are all about multi-tasking and multimedia functions in a compact mobile format. This is just what this Archos 101 Saphir wants to do. It has multiple mid-ranging features starting with an HD display and strong performance but at a high bargain price-tag. Rugged tablets or portable devices are a very niche market segment. To continue further, Android tablets is still taking its steps towards setting given norms. 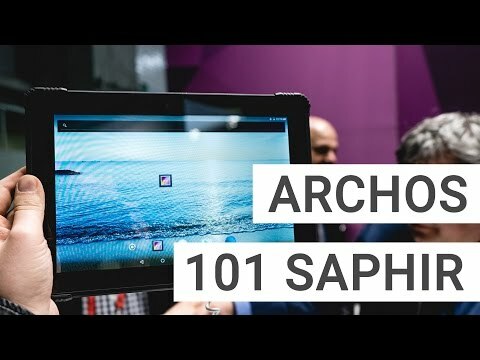 So, this Archos 101 Saphir is actually coming to a host of expectations. But, going from what's available on the paper, this has both the right features and a high value-for-money price tag. A rubber encasing on the 4 corners are as per expectations for a hard-core mobile device. Unlike its smaller 5.5 inch model, this tablet sports a design which is best for Landscape or Slate viewing. Big bezels on all sides along with a simplistic flat rear panel provide a confident hold and added protection for drops as high as 3 feet. This is not the best looking tablet with burly dimensions coming in at 265.4 x 181 x 13.4 mm and weighing 600 grams. But, then again, it's supposed to be strong and not chic by any means. Rugged tablets are all about being dust and water proof and accident resistant. They are not the ones to sport top-end feature and specs. Yet, keeping to these standards, this Archos 101 Saphir still boasts a nice 10.1-inch HD display. Screen resolution comes in at 1280 x 800 pixels and it scores IP54 dust & waterproof ratings. It is a 5-point IPS LCD touchscreen and is one of the better displays around in this segment niche. Color reproduction is above average and images show satisfactorily sharp details as per user reviews. Archos 101 Saphir has a Mediatek MT8163 chipset using a Quad-core Cortex A53 setup. This pairs up with an ARM Mali T720 MP2 series GPU (Graphics Processing Unit). With clock speeds coming in at 1.3 GHz, overall performance is just above entry-level and at par with expectations. But users can be rest assure that this device will provide smooth multitasking and HD multi-media functions. With few other rugged tab releases coming up, this will be a standout product running on an Android 7.0 Nougat. And this a huge selling point which is sure to attract buyers. Continuing with performance, Archos 101 Saphir comes with a 1 GB LPDDR3 RAM. It's faster than most other similar RAMs. Internal storage figures read in at 16 GB. It can be further extended to 128 GB via microSD card. This device has a single dedicated microSD slot. Archos 101 Saphir has a huge 6000 mAh Lithium-Ion Polymer battery. Battery run-times come in at around 5 Hours of HD video playback. Rear and front cameras are uncommon for this rugged mobile segment and especially this price tag. Archos 101 Saphir has a Fixed-Focus 5 MP primary rear camera along with a 2 MP front camera/camcorder. Archos 101 Saphir will include a rubber-encased keyboard in its package adding more value to the whole package. Philippines are an upcoming important hotspot for the mobile device industry. Not only does it play host to a huge number of manufacturers but also a rising consumer market. Archos 101 Saphir is a niche rugged tablet with multiple mid-range features. But what makes this tablet worth a mention is its value-for-features. As a product, it boasts an unavoidable affordability for buyers which will surely help in achieving strong sales figures in Philippines.